I am at a loss of what the issue could be. I would think it would be a lack or an excess of some kind of nutrients. I have a 29 gal tank (30Lx12Wx18H) and the substrate is about 2/3 aquarium gravel and 1/3 eco-complete. I have (2) Penguin 200 filters. There is a BeamsWork DA FSPEC LED Aquarium Light. 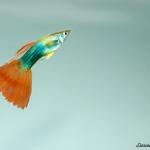 I have 4 Danios, 6 cory cats, 5 serpae tetras, 2 red wag plattys, 1 bristle nose plecco and 1 clown plecco. The tank has been set up now for a little over a year now and I have had a hard time trying to figure out what is going on with my plants. When the tank was first established I did not have the eco complete in it nor did I have both filters or the full spectrum light. That stuff didn't go into the tank till about 3-4 months ago.Once I added the new light and additional substrate (eco-complete) I noticed much more growth in my plants, however I still had the issue with the edges of my plants turning brown/black. I have amazon swords, moneywort, java fern, anubia nana, jungle val, and a handfull of S. Repens scattered throughout. The ferts that I have been using is 1 cap-full flourish excel every other day, 2 pumps NilocG Aquatics Thrive every 2-3 days and DIY root tabs made out of osmocote plus. The plants are growing fairly slow but thats to be expected with a mediumish light and no "true" co2 system. The problem is all the brown/black crap along the edges of the plant leaves. I have tried to rub it off between my fingers but it will not come off. Also, I have some BBA forming around the java fern and anubias. I been picking that off the best I can without tearing up the plants. Please let me know your thoughts on the matter and if you need more info then let me know and I will try to get it for you. I will try to get some pictures up soon. Do you know pH / kH / gH? How often do you use root tabs? How do you place them? How many do you use? How often do you gravel vac? Excel needs to be dosed every day at the high rate to have any effect at all. Water changes are usually once a week at about 33% the past week I have done 3 at about 25-30% because I am/was thinking my phosphate is high at roughly 5ppm. It is pretty hard water, I have a small bag of peat in with one of the filters. I could't tell numbers on kH or gH at the moment. root tabs are inserted under the roots about every 1.5 months. I use 1 tab per sword and I add 2-3 where I have small bunches of moneywort. 1 under the java furn. I don't vacuum the gravel. Or at least I haven't since I added more plants a couple months ago. Ok, I will start dosing close to a capfull everyday to see if that helps. I also have cryps that I forgot to add to the original post. Pictures would be the best bet. This is all I have on me, I took this a day or so ago to track its progress. The image does not do it justice. It looks worse in person. I will try to get some better pictures when I get home. Here are some better photos of individual plants. Well, I see algae and I see some poor plant growth. Reduce lighting to 5 hours a day MAX. Dim lights slightly as well. Do not increase lighting until algae is taken care of. Increase amount of water changed. Remove all decaying organics from substrate, filters and remove any affected plant tissue. Remove all decaying plant tissue. Ensure you are dosing the high rate of Excel / Metricide daily. Ensure you are fertilizing to meet plant requirements. Ensure the tank has adequate flow. Ensure your CO2 is at correct levels (if using). Spot treat particularly bad areas if manual removal is not adequate. Ensure you are achieving a balance of all nutrients, do not starve plants. If you are using Thrive, use at the recommended rates, and follow the water change recommendations. Consider some root tabs for larger, broad leaved plants. Optional. Do not bury java fern, anubias, bolbitus or buce in substrate. Attach to hardscape only. Can you expand on that red text please? Those plants are not too be planted into substrate. The rhizome will rot and the plant will die because of it if they are planted into substrate. Instead, use string, fishing line, super glue or simply wedge the plants onto rocks / driftwood / any hardscape in the tank. The roots growing out of the rhizome will find their way down to the substrate, and are fine to grow into the substrate on their own. I will reduce the light to 5 hours a day and dose the excel everyday. Wouldn't reducing the light make the moneywort droop more? I am not sure what is causing to to droop downward so much. I'm not sure if it could still be trying to get use to the new tank. They have been in the tank for 1-1.5 months. Can you tell if there is any nutrient deficiencies? I feel like it has a lack of Potassium. Does a Phosphate water tester measure potassium in with the phosphates? It just looks like there are pinholes in some plants and not sure if its the algae or lack of potassium.